Why Choose Management Information Systems Business Analytics? Business analytics is the practice of discovering business insights through exploration and analysis of business information and influence business decision-making through powerful and interactive visualization and data communication. Our business world is fast growing with data. Modern organizations need to quickly understand a vast amount of data and extract the relevant and valuable information so the best decisions can be made in a timely fashion. Business analytics educates and develops such talent and skill sets. You can enhance your existing domain of knowledge with the power of analytics. Business analytics has helped many companies to better understand their business operations, predict customer demands, monitor production, and improve efficiency and quality. The career outlook for business analytics professionals is increasingly attractive. McKinsey, Gartner, and other research agencies report that the U.S. could face a shortage of 190,000 individuals who possess deep business analytic skills and an additional 1.5 million managers with the skill set to implement the results. According to the U.S. Bureau of Labor and Payscale.com, average salaries of business analytics positions range between $75,000 and $88,000 with a bachelor’s degree and go above $90,000 with a master’s degree. Classes are focused on experiential learning, allowing students to apply concepts learned in class to real-world situations. We encourage our students to take internships during their summer semesters. Internships are coordinated through the college’s career management office, which makes sure you are aware of hiring information and job and internships announcements. 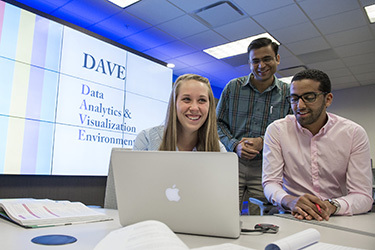 View Bachelor of Science in Business, management information systems business analytics program information, degree requirements, and graduation planning strategy in the University Catalog. View business core course requirements. Review the admission requirements and complete the admission application. Identify whether you will be majoring in management information systems with the business analytics concentration. If you are a current student and wish to change majors, go to the WINGS Express major/minor change request form and change your major. If you are an undecided/exploratory student, talk to your advisor about majoring in management information systems with the business analytics concentration.